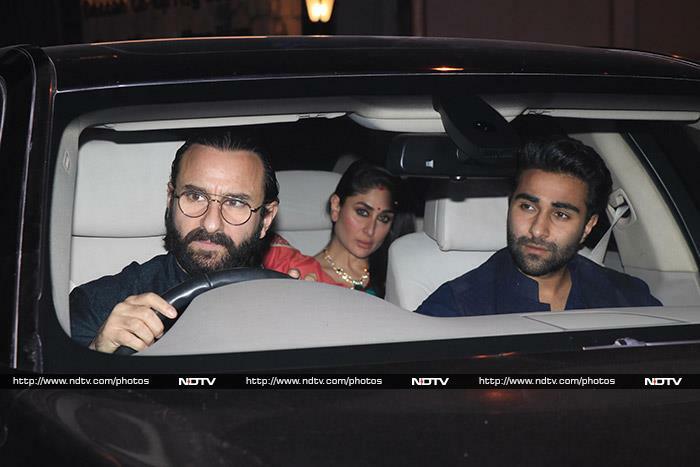 Kareena Kapoor, Saif Ali Khan arrived in style for Karan Johar's star-studded Diwali party, which was hosted on Wednesday night at his Mumbai home. Kareena wore a green sari and teamed up her look with a stunning necklace. Kareena and Saif were joined by her sister Karisma, who wore a peach-coloured suit. 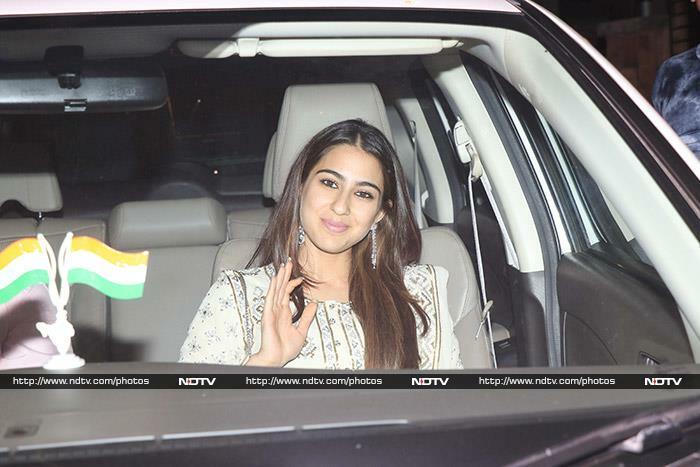 Saif's daughter Sara greeted the paparazzi with a million dollar smile. She looked beautiful in white. Malaika Arora opted for a green lehenga and matched her look with kundan jewellery. Amrita came with Malaika and husband Shakeel Ladak. Kiara Advani, pretty in white. Ananya Panday looked beautiful in golden. Ananya's Student Of The Year 2 co-star Tara Sutaria was also there. Bhumi Pednekar wore a peacock blue-coloured lehenga. She waved at the cameras before entering the party venue. Kriti Sanon picked up a sari for the party. Jacqueline Fernandez wore a light yellow lehenga. Sonakshi Sinha wore a yellow lehenga. Parents-to-be Neha Dhupia and Angad Bedi made a couple entry. Soha Ali Khan and Kunal Kemmu, why so serious? Shanaya Kapoor arrived with mom Maheep. Dia Mirza and husband Sahil Sangha arrive for the party. Pooja Hegde arrived with TV actor Karan Tacker. Kartik Aryan was all smiles for the paparazzi. Say hello to Varun Dhawan. Sidharth Malhotra greeted the paparazzi with a namastey. Raveena Tandon came with husband Anil Thadani. Farhan Akhtar opted for a casual look. Farhan's rumoured girlfriend Shibani Dandekar was spotted too. Arjun Kapoor's sister Anshula was also invited. Anu Dewan and husband Sunny were colour-coordinated. Director Punit Malhotra arrived with a friend. Riteish Deshmukh smiled for the cameras. Chunky Panday came minus wife Bhavana. Kabir Khan and wife Mini Mathur spotted at the venue. Tusshar Kapoor smiled for the cameras. Fashion designer Kunal Rawal arrives at the party. Sanjay Kapoor greets the paparazzi. Siddharth Roy Kapur was also spotted.